TVB youth drama, Wife Interrupted <救妻同學會>, which stars fan-shipped couple Moon Lau (劉佩玥) and Hubert Wu (胡鴻鈞) aired its first episode yesterday. In the most recent promotional event for the series, The casts were separated in groups and had played a string of laugh triggering games, involving charades and blindfolded eating tests. 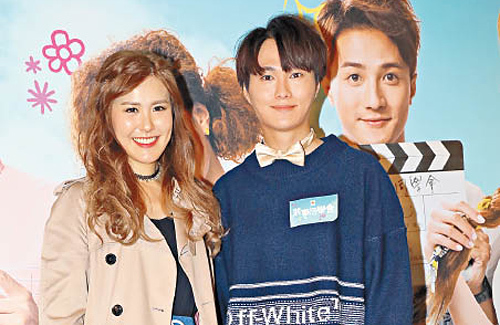 Since signing with TVB in 2013, Moon’s entertainment career has been very smooth. Earning the company’s love, she is heavily promoted and has participated in several popular dramas. With the recent success of Life on the Line <跳躍生命線>, Moon was nominated for the first time as TV Queen. Though happy about the nomination, Moon knows that she isn’t the best candidate. “Being nominated is already the biggest reward. I still need to improve and it’s too early for this big award. I’ll work hard with any character the company gives me.” She is also grateful for the acting advice that more experienced artistes have given her, which allow her to slowly improve and build up her skills.